The Moot is a board of representatives, one from each Hold in Skyrim, which is convened upon the death of the High King of Skyrim to choose the successor from any qualified members of the royal family. In 1E 369, the Skyrim War of Succession began after the death of King Borgas. Imperial historians attribute the war to the Moot's failure to appoint "the obvious and capable" Jarl Hanse of Winterhold. The war, which lasted over 50 years and shrunk Skyrim's empire considerably, ended with the Pact of Chieftains, who dictated that the Moot only be convened when the High King died without direct heirs. The Moot served in this limited role well, and was only called upon three times until at least the late Second Era. By the late Third Era the Moot still gathered to recognize the new High King, but more as a formality and theatrics. This was due to Skyrim's capital becoming the city most directly influenced by Imperial culture and politics, meaning the Jarl of Solitude typically served as High King without dispute. This was true up until the reign of High King Torygg in the early Fourth Era.. The Moot can reconvene during a living High King's reign if he breaks some taboo which makes the Jarls of Skyrim lose confidence in him, such as refusing a challenge made in the old traditions. 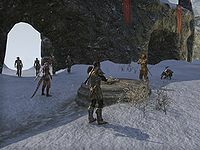 In the Second Era, the Ebonheart Pact was governed by the Great Moot, wherein decisions were ratified by representatives of the Pact's members. The Great Moot convened in the Pact's capital of Mournhold. In 2E 572, Jorunn the Skald-King of Eastern Skyrim was named acting High King of the Great Moot after he thwarted an Akaviri invasion, with the aid of Dunmer and Argonian forces. In 2E 582, Jorunn's rule was again ratified at the summit of Skuldafn following his brother Fildgor Orcthane's failed attempt to usurp the throne.